Until the nineteenth century, the hieroglyphs of Egypt were a linguistic mystery. Egyptians, Arabic-speakers for nearly 1,200 years, had lost the knowledge of their own ancient tongue. British and French linguists, anxious to solve the riddle, scoured Egypt and the reaches of the Nile for some clue to the dead language. Their searches were all in vain. The Rosetta Stone was found by accident. Napoleon's army, fortifying themselves in Egypt to resist a British attack, found the 2,000-year-old basalt slab in a pile of rubble blown apart by cannon fire. Etched in the black stone was a text translated into three languages: Greek, demotic, and hieroglyphic Egyptian. It was the key to breaking the hieroglyphic code. Within a few years, the language was cracked. Within a decade, French and British linguists were able to read hieroglyphic inscriptions that had stood silent for over a thousand years. Chance saved the Rosetta Stone: Arab conquers had built it into the walls of a fortress at Rosetta – cannon exposed it to French adventurers who immediately recognized its significance. But the ancient Egyptian language is just one of the legion of languages the world had lost to the past. Indeed, of the myriad languages still spoken today – an estimated 7,000 – many linguists agree that 50 to 60% of them will be dead before the end of the 21st century. Inspired by Egypt's Rosetta Stone, a team of engineers, linguists, and scientists are building a new artifact to stand the test of time: The Rosetta disk. The Rosetta Project is building an online database of all the languages it can codify, to preserve them for the duration of human existence. But digital media, while long lasting, is limited by the obsolescence of software. An optical disk might last a thousand years, but will Microsoft Word 98? So the project is also developing the disk, an analog artifact which, mass-produced and distributed, will hopefully survive to the distant future as a standing record of human language and culture. But the Rosetta Stone carried only three languages of one text. The disk will hold much more. The design of the disk – both in aesthetics and information – is impressive. 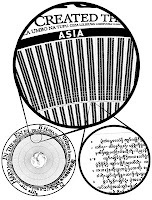 Each disk features a globe surrounded by radiating spokes. Within the spokes are 27,000 inscribed data pages – 27 pages for each included language. Like the Rosetta Stone, each language is translated, or transliterated if the language has no native script, into one parallel text (Chapters 1-3 of Genesis, the most widely and carefully translated writing on Earth). Additionally, each language features a glossed vernacular text, and English description, maps, the number system, grammar, and a basic vocabulary. Each language is grouped by continent and identified by a number that corresponds to a number on the central map. Surrounding the spoked ring of languages is a tapering spiral of Genesis translated into 8 major world languages (English, Russian, Hindi, Spanish, Hebrew, Mandarin, Arabic, and Swahili) begins at eye-readable scale and diminished to nano-scale. This reducing ring of text intuitively instructs uninitiated readers of the disk to get a microscope to see more. All of this data fits nicely onto one disk. 3 inches across. The technology used to create the disk was developed by Los Alamos National laboratories and Norsam technologies. Each nickel disk is protected by a 4-inch stainless steel and glass sphere – this glass magnifies the tapering text by a factor of 6x. In the base of each sphere is a steel ribbon that individual owners can use to mark their names, locations, and dates for posterity. 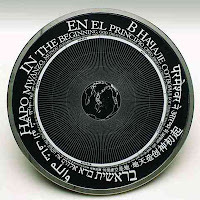 When mass-produced, the disk will be distributed to interested parties, institutions, and individuals. Currently, however, version 1 of the disk goes for $25,000 a piece. As of this writing, they have only sold two. It's funny, up until now I always thought the Rosetta Stone to be just the software to learn languages. I had know idea there was actually some historical valididity to it. Great piece - as a kid I'm learning a lot on blogger.